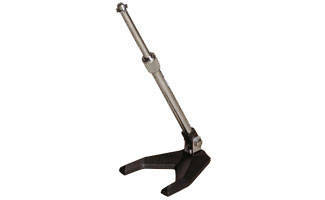 Tilting telescopic desk / instrument mic stand - 16-25"
PERFECT FOR MICING CABS, I USE A 57 AND AN i5. COULD BE CHEAPER. HAD TO TIGHTEN THE BOTTOM. PIVOT SO IT WOULD STAY AT THE ANGLE I NEED IT. NO BIG DEAL. I love these small footprint stands. I use them on stage and they never get kicked by the other players... unlike a large vocal mic stand would. They're well made and worth every dollar. Its an awesome stand. very durable and much better than a bigger stand. its a bit heavy but its no biggy. Using regularly with sm57 to mic various amps. Very useful and more ideal then using a full size mic stand. I'm using this to place an SM7 inside a kick drum. The weight of the mic causes the stand to tip over. I taped a 20lb weight onto the bottom of the stand to prevent this. The hinged portion where the arm mounts to the base doesn't operate smoothly and barely keeps the arm tilted up.